Adhesive backed vinyls for sign making fall into three categories; cast, calendared, and specialty. In other articles, we’ve talked about the differences between cast and calendared vinyl. Now we will discuss one of the most popular of our specialty vinyls. Holographic vinyl comes in a considerable variety of metalized adhesive backed films. Most of these offer stunning visual effects including iridescent rainbow finishes, surface textures, and of course, the holographic diffraction for which the category is named. Under the Schein Holographic label, SignWarehouse offers over 20 varieties in up to nine popular colors. Some of you may have experience with these high powered films. To others, this is a completely unfamiliar product. Modern manufacturing processes have made resulted in holographic films that are as brilliant as chrome bumper yet as durable as calendared vinyl. Plotting, weeding, and release properties have also improved. Let’s take a fresh look at what holographic films are, and how to use them to create dazzling signs and graphics. As noted above, holographic vinyl is not your typical pressure sensitive adhesive (PSA) film. Depending on the brand, it’s made from metalized PVC or metalized PET (polyester) with an embossed foil layer providing the distinctive visual character. The manufacturing process could be called a modern marvel. Iridescence, textures, and the ever popular holographic diffraction effects are embossed in the 2.5 – 3mil face film, then laminated with UV protectant, color and/or top-coat depending on the product. Schein Holographic vinyl is a metallized PVC film. Because of advances in manufacturing and materials, some of today’s holographic films are rated for up to five years outdoors. Not all brands and patterns are created equally, so ask before you buy. Schein holographic vinyl is an advanced film rated for five years outdoors in vertical applications. This outdoor life expectancy may be affected by where you install the vinyl. Please click here for important details about outdoor life of vinyl graphics. The most popular variants are the Chrome Polish and Diamond Plate patterns. Chrome Polish is perhaps the most visually intense vinyl available. The term ‘holographic’ vinyl comes from mainstays like the Lens products which feature a repeating fresnel lens pattern. The fresnel lens pattern creates the illusion of a convex ball in the surface. It’s sometimes referred to as “ball vinyl” or “Christmas tree” vinyl because the lenses look like holiday ornaments. Schein holographic films comprise a permanent acrylic, pressure sensitive adhesive laminated to industry-standard Kraft liners for easy release. As wonderful as the holographic and iridescent effects are, they do have a downside in reduced conformability and an aversion to water. More on that later. The list of possible applications is endless. These dazzling films have been used on everything from aquariums to Zippo lighters, on race cars and roller skates, store shelving and snow mobiles. Here’s a brief summary of some of the more common applications. Motor sports: Holographic vinyls have been used to create door numbers and graphics for stock cars for well over a decade. Its intense eye-catching impact appeals to speed demons from all over the USA and Europe. The most popular patterns for racing are the aforementioned Chrome Polish, Diamond Plate, lens and ¼” mosaic. Fluorescent vinyl is often used as an outline accent around holographic elements. General signage: As noted above, advances in computer controlled manufacturing have lead to more conformable and UV resistant holographics. Schein films are now rated for up to five years outdoors. So any sign substrate that is suitable for calendared PVC vinyl is a possible application for holographics. An iridescent silver, colored chrome or faux metallic finish might be just the thing to give your vinyl graphics a little more pizzazz. Contrast is one of the basic elements of good graphic design. You can’t get more visual contrast than Orange Chrome on a black substrate. And a faux gold leaf effect found in Schein Holographics Texturized films can be used for traditional sign applications like interior window signage. It’s a less expensive alternative to 22kt gold leaf. Custom vehicle graphics and accent stripes: The popularity of holographic vinyl in motor sports makes it a natural for custom vehicle graphics, and for the same reason. If you’re going to “pimp” someone’s ride, these vinyls should be in your tool kit. Unless your customer is restoring an entrant for the next Barrett-Jackson auction, he or she might be very pleased with a dash of red diamond plate. Retail window signage. When a retailer launches a promotion, effective POP signage is a must. One of the most effective uses of holographic vinyls I’ve seen was on the front door of a DFW area convenience store. They had placed a fairly small window graphic on the front door advertising the beverage that was on sale. Since it was done in a silver holographic vinyl on a black background, it was impossible to miss. The decal may have been supplied by the beverage distributor. Contact your local distributors and see if you can help them increase sales with this kind of eye catching retail signage. Shelf liners: A related application is found inside the store. A mall chain of costume jewelry stores has used silver holographic films to line store shelves. The brilliance of the metalized silver vinyl draws shoppers’ eyes to the high margin merchandise. Suggest this tactic to your retail customers. If you help them with more than just traditional signs and banners, you can become a valuable resource for all their marketing efforts. Digital Print media: In addition to its myriad uses in vinyl cutters, silver holographic and iridescent vinyls can be used as digital print media. Depending on your choice of print methods, you can use Schein vinyls to add distinctive visual elements to your graphics because the embossed textures and patterns remain visible under the printed images.• Schein silver holographic vinyls can be used to create unique effects with thermal resin and solvent/ecosolvent printers. Not all holographic vinyls have this capability. Some brands are made from metallized polyester and are not suitable for inkjet printing. 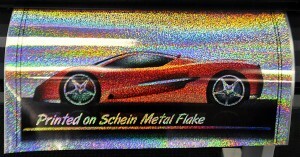 Schein and most other holographic films can be imaged with thermal resin printers like the Gerber Edge and Summa DC3. Printing on colored holographic vinyl – or any colored vinyl for that matter – is not recommended because colored substrates throw off the CMYK values and cause unpredictable color shifts. Publishing, Scrap booking, Décor and more: Guinness Book of World Records publishes and annual update in hardback. Each year, there is a large holographic vinyl element on front cover. If holographic vinyl is suitable for hardback book covers, why not scrap booking? Schein Sequins could be a wonderful choice for scrap book and interior décor graphics. Speaking of interior décor, Home and Garden TV has shown high end kitchen backsplash designs made from holographic vinyl. Be sure to laminate to protect from water. More on that later. And finally, because it’s made from self-extinguishing, non-burning PVC resins, Schein holographic vinyls are sometimes used as stage backdrops for concerts and other theatrical presentations. The metallized foil face films that make the embossed effects possible also have a few drawbacks. As is the case with ultrametallic cast vinyls, the metallic element makes them a little less conformable, so they’re not recommended for application over rivets and compound curves. For the same reason, banners are not recommended substrates for holographic vinyl. A banner waving in the breeze can become a compound curve which is a challenge for metallized films. The metallized layer can be corroded by contact with moisture. Wet applications using standard application fluids or dishwashing liquid may corrode the face film. Wet application of these products should be avoided whenever possible. If you must use application fluid, we recommend RapidTac II, which is specially formulated for use with non standard vinyls. For marine applications, seal holographic vinyl with an overlaminate film or layer of transparent vinyl to protect from water damage. The best way to seal the film is to overcut the laminate layer so that it forms a ¼” border around the vinyl. Some customers prefer using Frog Juice or ClearJet liquid laminate and a Sealit Pen. As a roll of holographic vinyl is fed through a vinyl cutter or printer, sometimes the film begins to separate from the release liner. This is referred to as “tunneling”. It’s a minor issue because plotters will cut through the tunneled face film successfully so the quality of the weeded graphic is not affected. Tunneling in digital printing can be overcome by raising your printer’s head height to the higher setting to avoid head strikes. If you have yet to use holographic vinyl in your shop, make adding these dazzling products one of your new year’s resolutions. If you’ve written them off as being only for short term graphics or stock cars, it’s time to take a fresh look at this thoroughly modern marvel. Feel free to share your favorite or most unusual applications for holographics in the comments below.